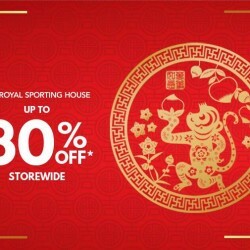 Head down to your nearby Royal Sporting House store and enjoy great savings this Lunar New Year! In addition, receive an $18 voucher for every $108 nett spend. While stocks Last! 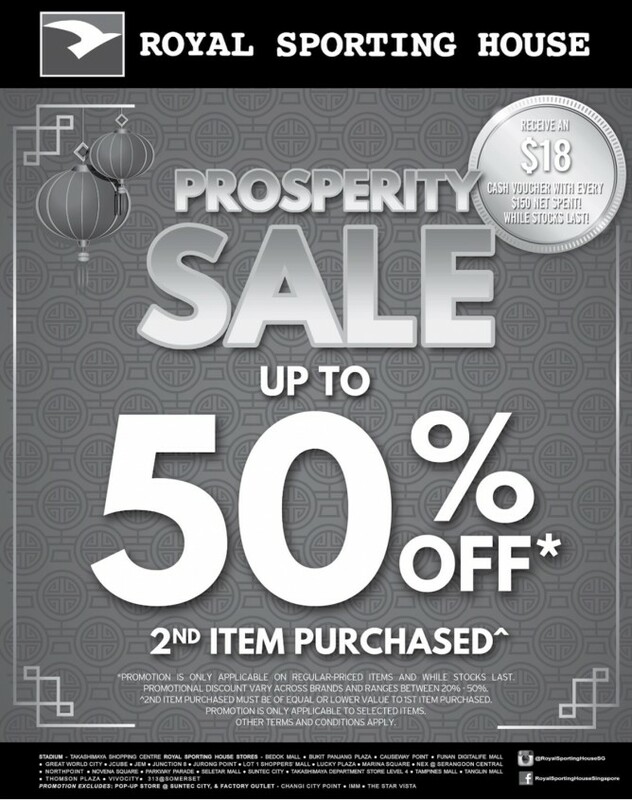 Prosperity Sale ends 28 Feb 2016. Terms and conditions apply at here. 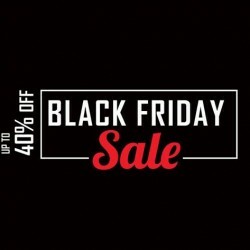 Till 27 Nov 2015 Royal Sporting House: Black Friday Sale @Save 40% OFF–No Min. Spend Required. Enjoy Royal Sporting House offers 40% OFF for 1 day only on 27 November 2015. No minimum spend required. Promotion is valid at Stadium and all Royal Sporting House stores excluding outlet stores IMM, Changi City Point, and The Star Vista). Other terms and conditions apply. 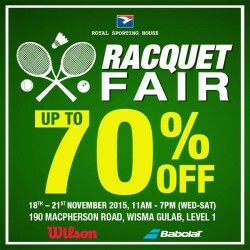 Come and grab Royal Sporting House offers Racquet Fair with up to 70% OFF Badminton, Tennis, and Squash merchandize from the world’s leading brands. Tis’ the season to be jolly indeed! 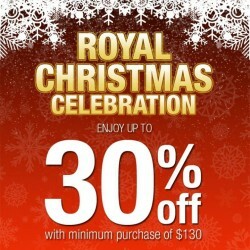 Enjoy up to 30% off at all Royal Sporting House stores (except factory outlets) from now till 24 Dec 2015. Terms and conditions apply. 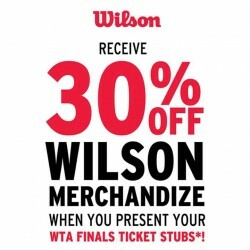 Catch the exciting action served up by the best tennis stars in the world at WTA Finals Singapore and present your ticket stubs to receive 30% off Wilson merchandize! (Excluding tennis balls). Terms and conditions apply. 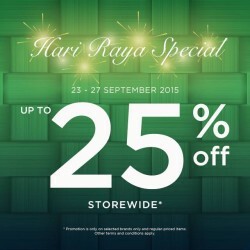 Promotion from 17 Oct – 1 Nov 2015. Valid on regular-priced items at all Stadium and Royal Sporting House stores (except Lucky Plaza, Lot 1 and Alexandra Retail Centre). Original or electronic ticket to be presented at point of purchase. See here for more details. 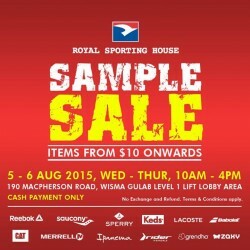 8 - 11 Oct 2015 Royal Sporting House: Up to 80% off at Mega Warehouse Sale! 7 Oct for Safra Members! 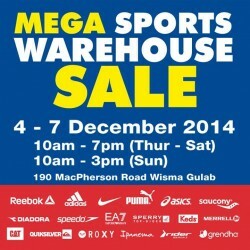 The Royal Sporting House Mega Warehouse Sale is back! If you want to grab new sports apparel or gear, dun miss this mega event happening from 8 to 11 October 2015! Check out the last sale that they had here. If you are a Safra member, lucky you, you will get an exclusive preview on 7 October 2015! This means you get to grab all the stocks before anyone else! Mark your calendar now! And before you head down, check out our tips to survive a warehouse sale here! Enjoy for an exclusive Royal Sporting House offers Hari Raya Special. Wishing all Muslim friends Selemat Hari Raya Haji. Here's a special promotion to celebrate this joyous occasion, starting from today till 27 Sep 2015. Grab this Sample Sale For only 2 days from 5 - 6 Aug! available at Royal sporting house Head down now, before enjoying the long weekend! Cash Payment Only. While stocks last! 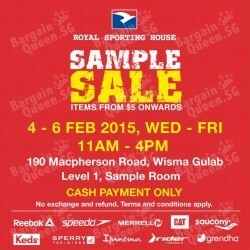 Another sale from Royal Sporting House! 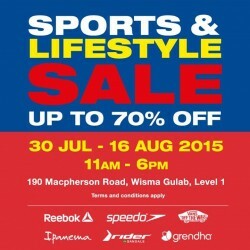 Their sports & lifestyle sale is back with discounts up to 70% off from now till 16 August 2015! If you are looking for swimwear, sports shoes or even flip-flops, definitely head down to this sale which features brands like Reebok, Speedo, Vans, Ipanema, Rider and Grendha. Usually such sales feature the older designs but it will still be a good deal if you are looking at functional usage instead of the latest designs and technology! Grab this great sport sale today and get up to 30% off with %12 nett purchase final reductions additional 10% off final bill.plus enjoy 5% on rebate on top of all discount. 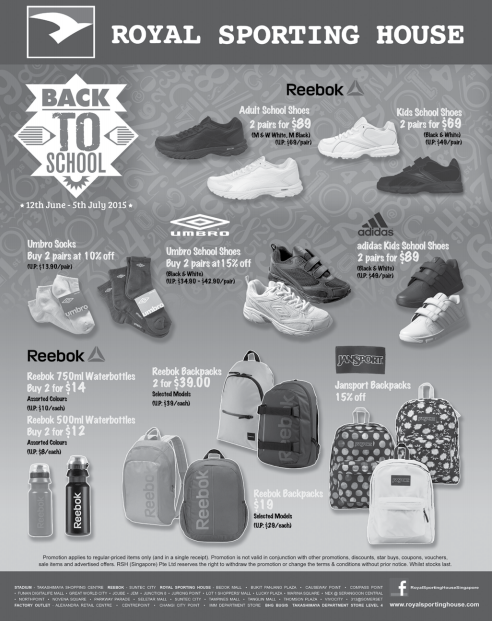 Enjoy and get yours today this Royal Sporting House Back To School hurry grab this now! Royal Sporting House is having there Great Sports Sale starting today up to 20% off with $60 nett purchase and 30% off with $120 nett purchase. So don’t miss this out and enjoy your shopping! 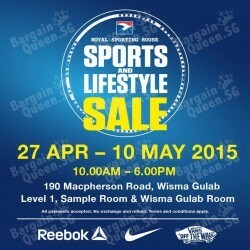 Royal Sporting House is having a Sports And Lifestyle Sale from 27 Apr – 10 May 2015. Visit them to enjoy various products discounts. All payments accepted. No exchange and refund. Terms and conditions apply. 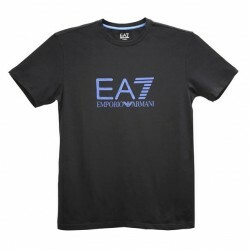 Save up to 30% Off all EA7 merchandize! EA7 storewide promotion is only available at Stadium at Takashimaya Shopping Centre and Royal Sporting House stores at Vivocity, Marina Square, Jem, 313 @ Somerset , Tanglin Mall and Parkway Parade from now till 28 Feb 2015. Terms and conditions apply. The Sample Sale is back! Only for 3 days from 4 - 6 Feb with items from $5 onward! While stocks last! Hurry down before it's too late! See you there! 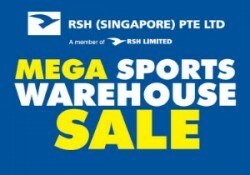 Royal Sporting House offers up to 30% Off all EA7 merchandize! EA7 storewide promotion is only available at Stadium at Takashimaya Shopping Centre and Royal Sporting House stores at Vivocity, Marina Square, Jem, 313 @ Somerset , Tanglin Mall and Parkway Parade from now till 28 Feb 2015. For this CNY, save up to $30 on Reebok Classic Jogger, now retailing at $59! 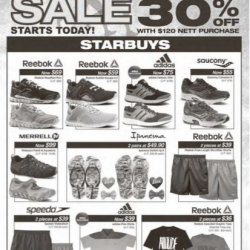 Starbuys promotion is available at all participating Royal Sporting House stores from now till 28 Feb 2015. While stocks last! Terms and Conditions apply. The LifeStyle Sale is now on! 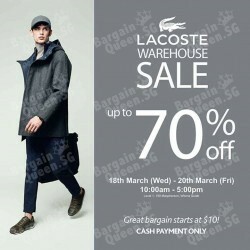 Don't miss out on discounts of up to 70% Off, only from now till 31 Jan, this Saturday! Hurry down before it's too late! See you there! 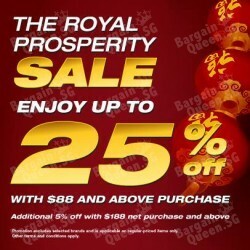 The Royal Prosperity Sale is now on! Enjoy up to 25% OFF with purchase of $88 and above, and an additional 5% OFF with purchase of $188! The Royal Prosperity promotion is available at all participating Royal Sporting House stores from now till 28 Feb 2015. To Celebrate the coming Chinese New Year! They are having their Royal Prosperity Sale! 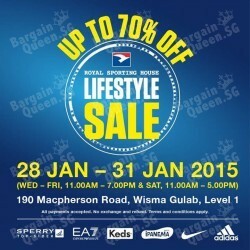 Come on down to Royal Sporting House stores to enjoy discounts of up to 25% OFF with $88 and above purchases. And an additional %5 OFF for purchases above $188. QUICK! SALE of Up to 50% OFF! Ends on 11 JAN, Saturday! 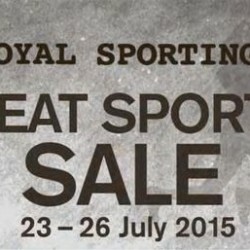 Come on down to your nearest Royal Sporting House store to enjoy this special promotion! #Update: BargainQueen.sg readers have send back the update from the site. please check the images below. 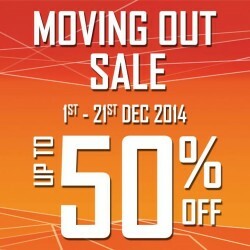 Moving Out Sale - Enjoy up to 50% OFF at Royal Sporting House Paragon! From 1 to 21 December 2014.